Contentment is the byproduct of aligning your priorities in the order of their importance according to God's will and purpose for your life. Your purpose, the reason for which you exist, is realized as you make that fulfillment your first concern. Matthew 6:33 (The Message) Says "Steep your life in God-reality, God initiative, God-provisions. Don't worry about missing out. You'll find all your everyday human concerns will be met". 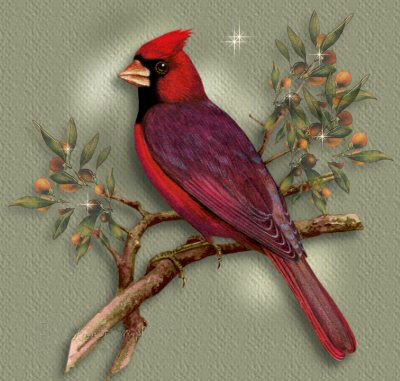 There was a beautiful Cardinal, a handsome strong red bird who was offered some of his favorite food for feathers. After pondering the proposition he looked at his life and thought to himself, “Things are not so bad, but there must be something better than spending my time and energy working for food.” The daily routine (of flying around from place to place; and searching for flower-buds, seeds, berries, fruit, and an occasional insect) wasn't all that bad, but now it was time to do something different. The Cardinal decided to give up a few of his beautiful red feathers, maybe two or three for some food. He made his first exchange, ate a delicious meal, and spent the day flying around. The first day went well so he went back and traded again. The Cardinal began to spend his time going to the beach, playing in birdbaths, and relaxing in the sun. He thought he had missed the brighter side of life by being so involved in the monotony of responsibility. In the back of his mind he kept hearing a small voice warning him about giving feathers, but he wasn't doing anything wronghe was just having fun. So began the process. After a time, it became difficult for him to flybut it didn't matter. He simply started walking to get his food and stayed close to his food supply. Then one day the Cardinal woke up and looked at himself in the mirror. His beautiful red feathers were gone and he looked old and ugly. He went outside and frantically flapped his wingshe could not fly at all. The Cardinal became hungry and went to get some food but no one was willing to give a featherless bird food for nothing. He had given away his power to fly and his ability to care for himself. He was earth-bound and limited. The story of this Cardinal serves as an example of what happens to those who get their perspectives out of sequence. Diligently pursue God's best and do as Ralph Waldo Emerson suggests, “Spend yourself on the work before you, well assured that the right performance of this hour's duties will be the best preparation for the hours and ages that will follow it.” Everyone should carefully observe which way his heart draws him, and then choose that way with all his or her strength (Hasidic Proverb).